In its latest production, Treasures of New York goes on a private tour inside Hearst’s world headquarters to explore New York City’s first completed “green” office building, a recent iconic addition to the City’s famed skyline. 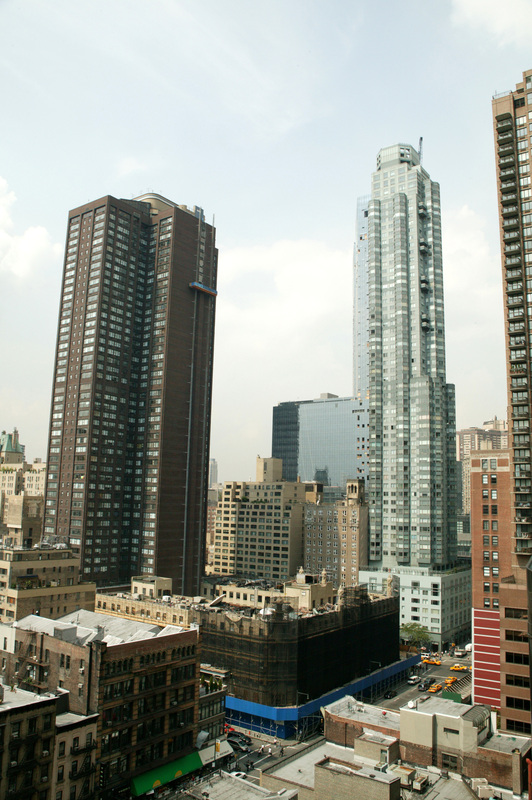 The 46-story high-rise is usually closed to the public but not to public television viewers. 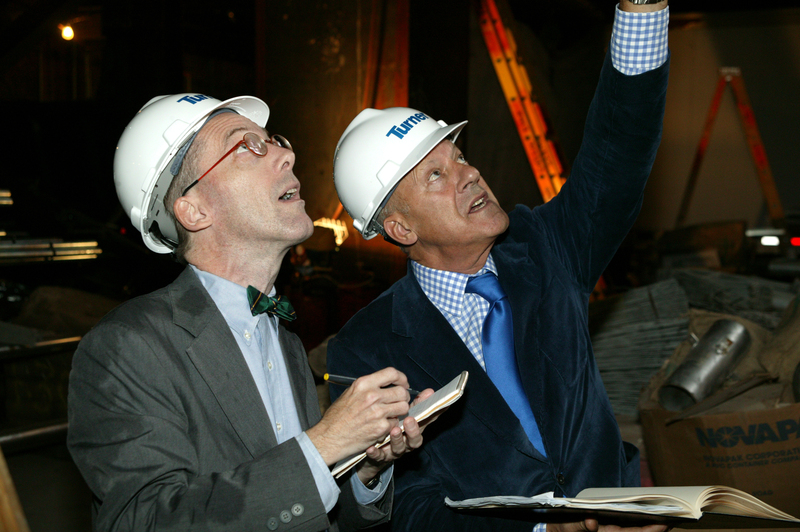 Hosted and narrated by Emmy Award-winning journalist Paula Zahn (NYC-Arts), Treasures of New York: Hearst Tower premieres Wednesday, March 7, 2012 at 7:00 p.m. (ET) on WLIW21 and Thursday, March 8, 2012 at 8 p.m. on THIRTEEN. After broadcast, the program will be available to national audiences at thirteen.org/treasures-of-ny. The website offers past episodes and conversations with visionaries behind New York’s greatest institutions. 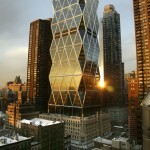 Hearst Tower redefined the modern skyscraper and pioneered a sustainable architectural vision for the 21st century. Timed with Hearst Corporation’s 125th anniversary, the film also highlights Hearst’s history and growth into one of the America’s largest diversified media and information companies. In addition to revealing Hearst Tower’s engineering marvel, WNET gets exclusive access inside all of the Tower’s state-of-the-art spaces, including its digital photo studio, 165-seat theater, Cafe57, health club and the renowned Good Housekeeping Research Institute. WNET gains insight about the Tower from Hearst Corporation CEO Frank A. Bennack, Jr., who talks in detail about the company and how executives green lighted construction of the Tower just weeks after 9/11; Hearst Director & Architecture Committee Chair Gilbert C. Maurer; Marie Claire Editor-in-Chief Joanna Coles and mentor to competing designers on Lifetime’s Project Runway, who gives a glimpse into the making of the fashion magazine; Pritzker Prize-winning architect Lord Norman Foster; Architecture Critic for The New Yorker, Paul Goldberger; and former Chairman of the New York City Landmarks Preservation Commission, Jennifer Raab, among others. Treasures of New York explores New York’s cultural heritage by spotlighting its points of interest, distinguished establishments and notable figures. The series is a presentation of WLIW21 in association with WNET, the parent company of THIRTEEN and WLIW21, New York’s public television stations and operator of NJTV. For nearly 50 years, WNET has been producing and broadcasting national and local documentaries and other programs for the New York community. Standing in Midtown Manhattan on the corner of Eighth Avenue and 57th Street (to be renamed Hearst Place for the week of March 5 to mark Hearst’s anniversary), the glass-and-steel high-rise soars from the original six-story landmark structure built in 1928, designed by Joseph Urban. William Randolph Hearst always envisioned the building as a skyscraper, but construction of a tower was halted by the Depression and World Wars. 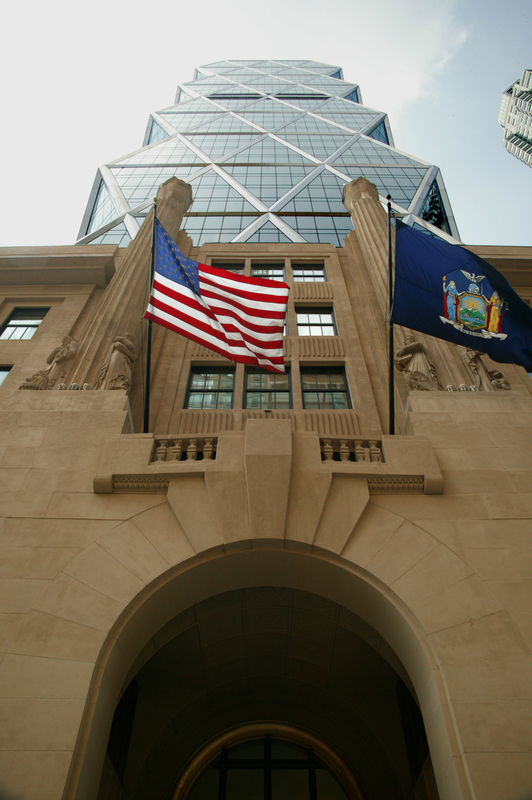 Development began right after 9/11 and Hearst Tower opened in 2006 with an innovative diagrid (diagonal grid) formed by interlocking triangles as a contemporary response and completion to the existing art deco base. 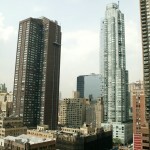 The sturdy diagrid design allowed it to be the first New York City skyscraper without vertical beams. Designed by Foster, the Tower balances modernity and tradition, while looking to the future by adhering to environmental ethics. It was the first New York City office building to receive the coveted Gold rating under the U.S. Green Building Council’s Leadership in Energy and Environmental Design (LEED) program. Some of the key environmental-friendly elements include the faceted façade frame, which uses 20 percent less steel than a traditional skyscraper, low emission glass that keeps out solar radiation and sensored lighting that automatically adjusts based on the amount of natural light. 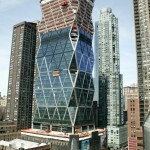 Innovations like this allow Hearst Tower to use 26 percent less energy than a standard office building. 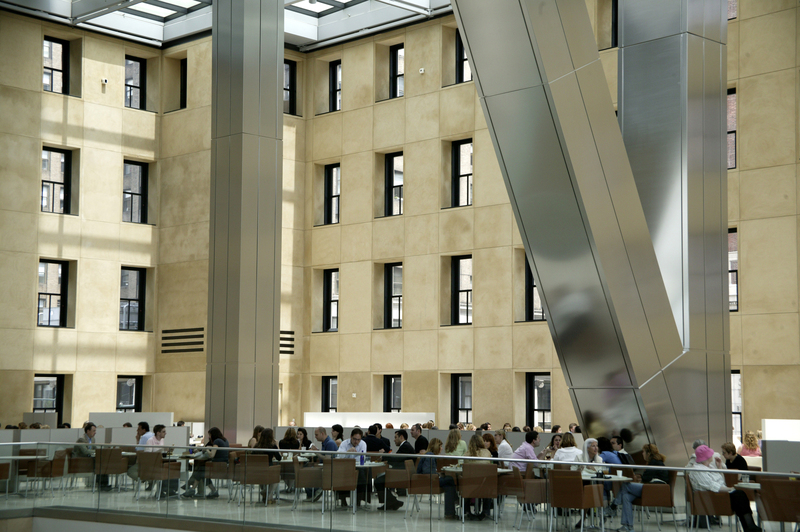 Rainwater collected on the roof is used to water plants and power Icefall, a three-story sculpted water feature in the building’s atrium. 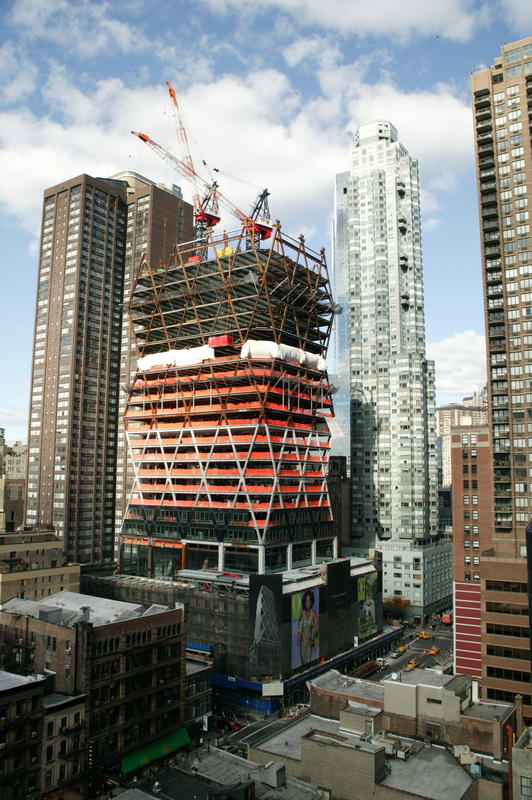 As Foster’s first skyscraper in the United States, he views the construction as a statement about New York’s resilience and optimism after the collapse of the World Trade Center. Hearst Corporation dates back to March 4, 1887, when founder William Randolph Hearst took ownership of the San Francisco Examiner and gradually transformed American journalism in both content and operations. Under his leadership, the company acquired a chain of newspapers and modernized newspaper publishing by introducing color printing, comic syndication and a wire service. In the early 1900s, Hearst’s success with newspapers expanded into a burgeoning magazine venture that now includes titles such as Cosmopolitan, ELLE and Good Housekeeping—more than 300 titles in total around the world. 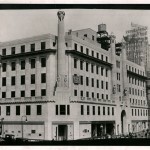 Today, Hearst’s portfolio is diversified into more than 200 businesses in the areas of magazine, newspaper and business publishing, cable networks, television and radio broadcasting, internet businesses, television production, newspaper features distribution, business information and real estate—all headquartered at the world-famous Hearst Tower. 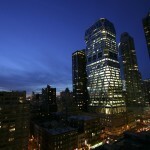 Treasures of New York: Hearst Tower is airing as part of WNET stations’ membership drive. Major support for the program is provided by Hearst Communications Inc., Cheryl and Philip Milstein Family, and the Metropolitan Media Fund. The film is a production of WLIW21 in association with WNET and Hearst Corporation. Executive Producer is Diane Masciale. Assistant Producer is Rebecca Fasanello. Researcher is Elizabeth Muentes. Executive-in-Charge of Production is John Servidio. 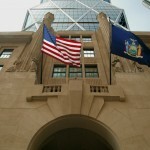 Hearst Corporation (www.hearst.com) is one of the nation’s largest diversified media and information companies. Its major interests include ownership of 15 daily and 37 weekly newspapers, including the Houston Chronicle, San Francisco Chronicle, San Antonio Express-News and Albany Times Union; hundreds of magazines around the world, including Good Housekeeping, Cosmopolitan, ELLE and O, The Oprah Magazine; 29 television stations, which reach a combined 18 percent of U.S. viewers; ownership in leading cable networks, including Lifetime, A&E, History and ESPN; significant holdings in the automotive, electronic, medical/pharmaceutical and financial information industries; Internet and marketing services businesses; television production; newspaper features distribution; and real estate. 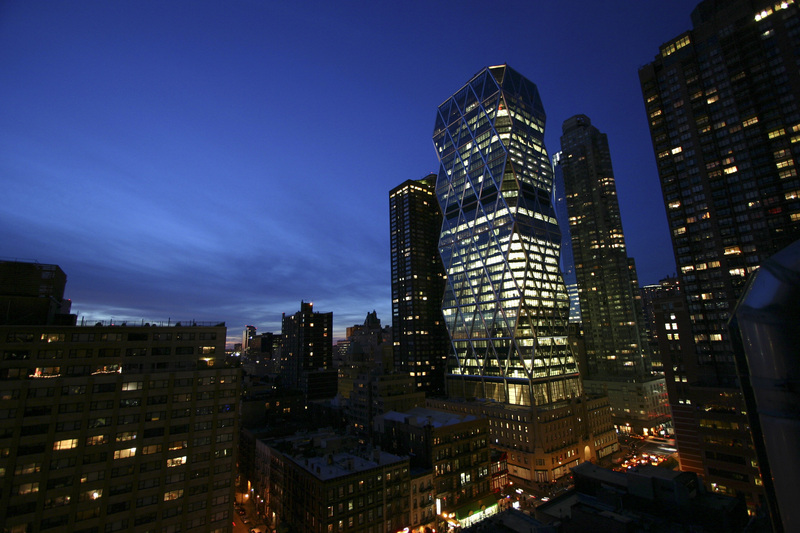 At night, with its radically angled panes of glass, Hearst Tower looks like a faceted jewel. 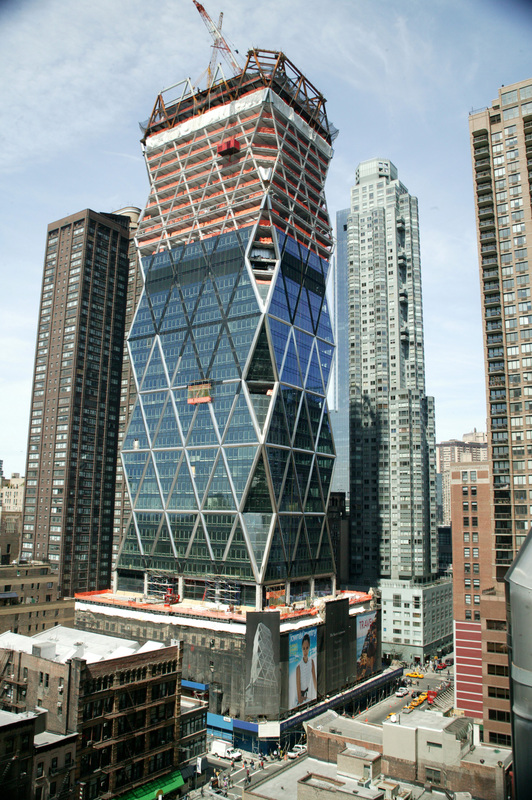 Hearst Tower’s distinctive glass-and-steel diamond-cascade design is referred to as a “diagrid” – diagonal-grid and is the only skyscraper in North America to carry this design. 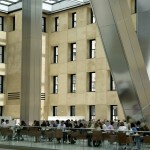 By eliminating the six floors of offices that served Hearst Corporation for 70 years, the architects have created a grand, spacious piazza on the third floor of the Hearst Tower, containing a café and a figurative “town square”. 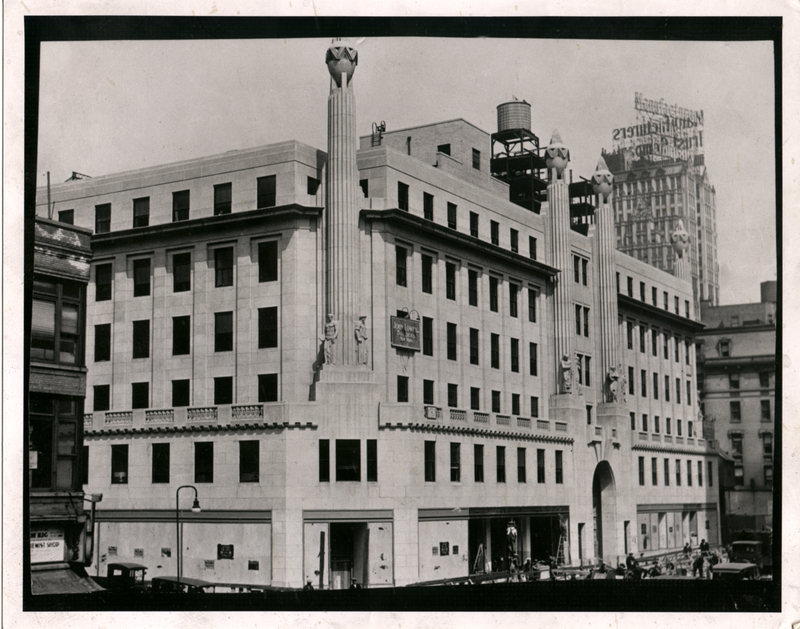 1930: The International Magazine building. 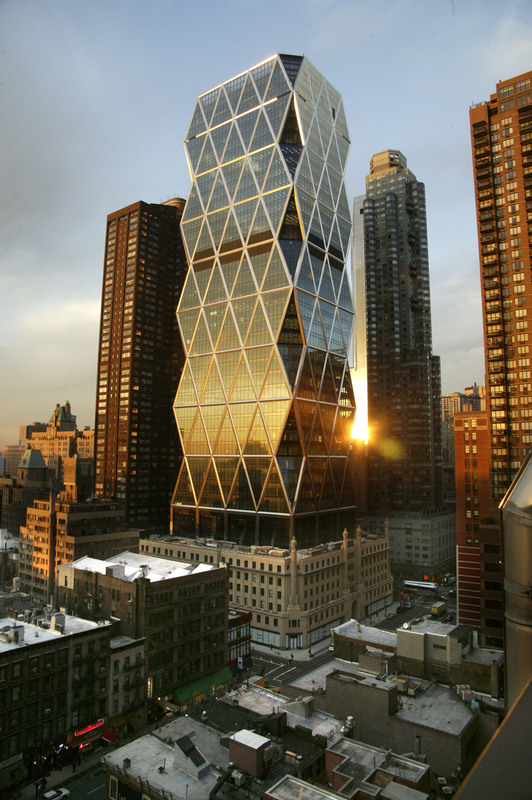 2005: Hearst Tower is the first New York City Landmark of the 21st century and a true pioneer in environmental sustainability. 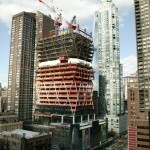 2003: Hearst Tower at the beginning of its construction in 2002. 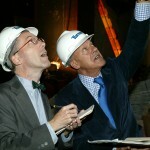 Architect Lord Norman Foster discusses construction during the building of Hearst Tower.